CLEVELAND — It hasn’t taken Leonys Martin long to adapt to his surroundings and teammates, and Cleveland’s new center fielder will be in the lineup Monday night, batting ninth, as the Indians welcome the Minnesota Twins to Progressive Field for a four-game series. Martin was acquired from Detroit in a July 31 trade that saw Cleveland send minor league shortstop prospect Willi Castro to the Tigers. In Martin’s first four games with the Indians, he is 4-for-11 (.364) with two home runs, three RBIs and three runs scored. “I’m really happy with my start here. I came here to do the best I can to help this team get where we want to go,” Martin said. The 30-year-old left-handed hitter was plugged immediately into the No. 9 spot in manager Terry Francona’s lineup, and Martin has hit the ground running in Cleveland. Martin says he’s comfortable hitting ninth. On Monday, Martin will also be playing behind one of the best pitchers in the American League, as right-hander Trevor Bauer (10-6, 2.34 ERA) will make his 24th start. Bauer has pitched his way into the Cy Young Award discussion. He’s third in the league in strikeouts, third in innings pitched and fourth in ERA, and is in the top seven in strikeouts per nine innings and opponents’ batting average. Bauer hasn’t lost a game since June 29. In six starts since then, he is 3-0 with a 2.03 ERA. In his last nine starts, he is 5-1 with a 1.80 ERA while averaging 11.1 strikeouts per nine innings and holding opposing batters to a .213 average. Bauer is 1-1 with a 3.75 ERA in two starts against the Twins this year. In 18 career appearances vs. Minnesota, he is 5-7 with a 4.72 ERA. 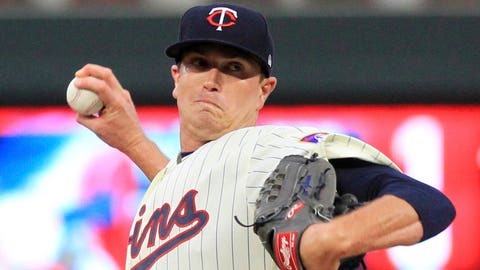 Kyle Gibson will start for the Twins on Monday in what will be a reprise of the pitching matchup on July 31 in Minnesota, which was each pitcher’s last start. In that game, Bauer and the Indians beat Gibson and the Twins 6-2. Bauer pitched 6 1/3 innings, allowing two runs and four hits with three strikeouts and four walks. Gibson pitched six innings, giving up three runs and five hits with six strikeouts and three walks. In three starts against the Indians this year, Gibson is 1-1 with a 2.89 ERA. He has made 16 career starts against Cleveland and is 3-7 with a 5.16 ERA.